Glenmorangie Companta is said to be inspired by the travels of Dr Bill Lumden, Master Distiller of Glenmorangie and Ardbeg, through the vineyards of France and the friends he met along the way. Suitably called “Companta” (which is Scots Gaelic for “friendship”), this whisky is matured in American oak casks then extra matured in Grand Cru casks from Clos de Tart and fortified wine casks from Côtes du Rhône. This extra maturation in these ex-French wine casks, as the below tasting notes indicate, seems to give the whisky an oaky and spicy kick that is softened by layers cooked fruit, berry jam and cherry rocky road. The American oak, radiating with vanilla and coconut, beams through textured layers of cranberry, cashews, hay, honey, chocolate, port glazed dates and cherry ripe. While sweet, the bouquet also offers gusts of drying wine and occasionally notes of fruit cake and pear salad with red wine vinegar emerge. The bite of wood and sharp winy notes is softened by cherry and rose rocky road, caramel and mixed berry jam, and in the backdrop sits a creaminess interwoven with citrus marmalade. Then comes the spice – mostly rigid and peppery – with varying shades of oak and the curious occasional snaps of bitter flowers. The finish offers an electric foray of spice, amidst berry compote, guava and wood. As the spice dies the finish remains warming, and the alcohol fumes off the tongue with mild herbal undertones. Buy it, if you want to explore the flavours that can be infused into American oak matured whisky by additional maturation in ex-French wine Grand Cru casks from Clos de Tart and fortified wine casks from Côtes du Rhône. The whisky ignites the palate with spice, berry jam and cherry rocky road in particular, but this complex little number always has a pleasant surprise up her sleeve – a very interesting and tasty dram, highly recommended. After trying this whisky over some Ben & Jerry’s cookie dough ice cream, the sight of the Glenmorangie symbol now makes me salivate on cue like one of Pavlov’s dogs. 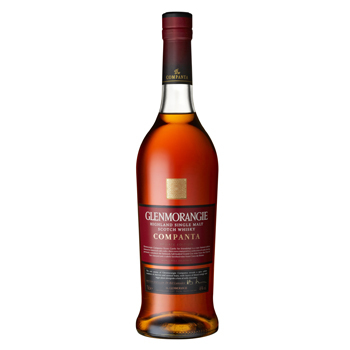 Try Glenmorangie Companta with a good quality ice cream packed with cookie, nuts or fruit. This whisky also paired nicely with a number of medium strength cigars that offer some spice and wood, along with chicory bitterness – try it with Romeo y Julieta Wide Churchills Cubans or La Gloria Cubana Dominicans. This entry was posted in Highlands and tagged ben & jerry's, cigar, french wine, glenmorangie, ice cream, Scotch, single malt, whisky, wine. Bookmark the permalink.